How many engineers does it take to change an LED bulb? You are here: Home / Around the Puck / How many engineers does it take to change an LED bulb? Suzanna Long is helping MoDOT develop a schedule for replacing LED bulbs in the state’s traffic signals. 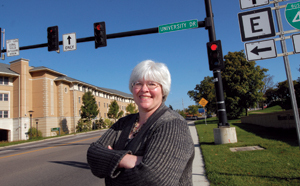 A group of S&T researchers led by Suzanna Long, assistant professor of engineering management and systems engineering, is working with the Missouri Department of Transportation to measure the intensity of LED traffic lights. Light-emitting diodes or LEDs have replaced standard bulbs in many of the nation’s traffic lights. Even though they’re brighter than standard bulbs and have a longer life, knowing when to replace them is a guessing game, Long says. While working with MoDOT on a data-driven replacement schedule for LEDs, her team created a laser-guided device to measure LED intensity from the side of the road at night instead of requiring technicians to physically check traffic lights using a bucket truck. The project, named one of the 2012 “Sweet 16” High Value Research Projects by the American Association of State Highway and Transportation Officials, appeared in the Engineering Management Journal’s special issue on transportation management last September. Working with Long are Mariesa Crow, the Fred W. Finley Distinguished Professor of Electrical Engineering; Abhijit Gosavi and Ruwen Qin, assistant professors of engineering management and systems engineering; and C.H. Wu, professor of electrical and computer engineering.